Now that November has come and gone, my team and I are setting some fresh goals to start things rolling again. There's still a lot of conceptualization being done on the Labyrinth, and I get to do some really fun stuff: detail mock-ups. I have several aesthetic ideas that I would love to incorporate, and to accomplish this I'm blocking in some of the larger details. Then I'll screenshot the room and bring it into Photoshop to paint over. Right now I'm currently working with our existing assets to get a few things as close to what I envision so it's less work in Photoshop. I'll post screenshots and the mock-ups next week. Another of my tasks is to concept our four main mechanics. Basically, my job is to draw out what they should look like and hand them off to our part time concept artist Mike to spice up. 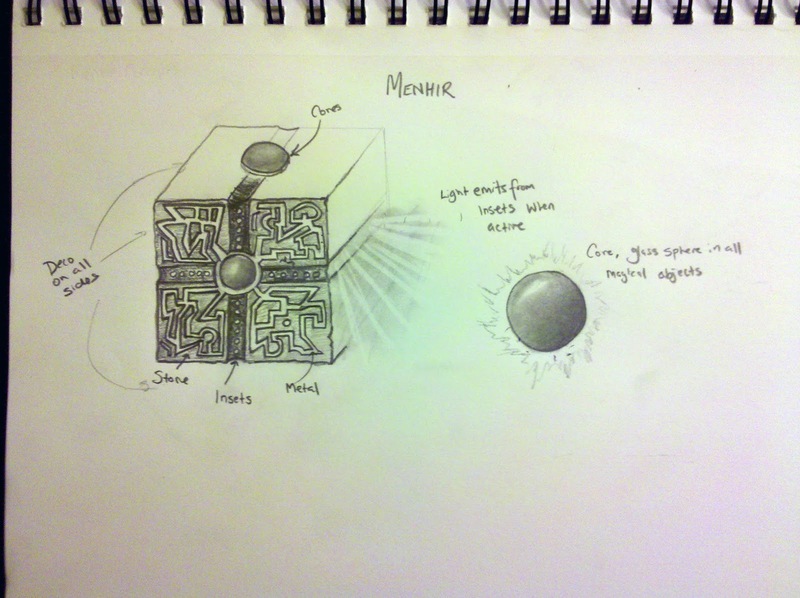 Here is an example of the Menhir concept I wound up with. 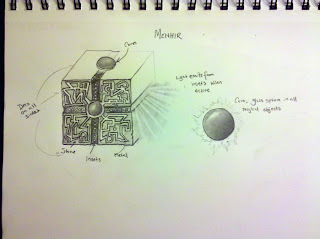 I'm currently working on our Prism concept, and will be working on the Gargoyle and Zephyr Stone in the future. What's great (and daunting) about being a level designer is I get to delve into a myriad of creative disciplines: architecture, art, scripting, and writing to name a few. In my spare time I really enjoy writing, especially character descriptions and biographies, environmental descriptions, short stories, and sometimes even poetry. I decided that, while it's not a crucial element of my work, I should post some of my writing. In other news, my friend and colleague Tyler Coleman wrote an article for AltDevBlogADay, and it was reposted on Gamasutra here. The topic is Procedural Generation Cost Analysis, and is worth five minutes to check out. Nice job, Tyler!